Trinity's new building has now re-opened following its refurbishment, and over 200 people attended the first Sunday service - giving the fantastic new building a big thumbs up! The official opening service took place on 9th May 2015, which was attended by several former Ministers, including Rev Tim Thorpe who was Minister at Trinity when the redevelopment project planning began. 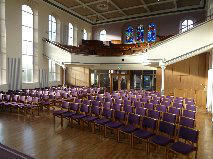 In the new building, a light airy welcoming foyer has been created as well as kitchen and toilet facilities, the pews have been removed and a new heating system has been installed to create a series of flexible and comfortable spaces. "It has been a terrific effort from the congregation and the wider community to raise the money and to realise our vision of serving the community in a new way. ”The new building will help us serve the Trinity family and the wider community and develop the work we do with young people, families and the older generations. 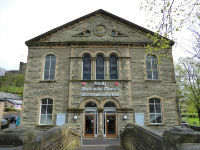 We can now offer a first class facility to the Ribble Valley, which will be open for celebrations, performances and fellowship opportunities for old and young, as well as weddings, baptisms, funerals and worship. The money raised included £200,000 from events and individual donations, and grants from a variety of sources, including Lancashire Environmental Fund, Garfield & Weston, National Churches Trust and Norwood & Newton. 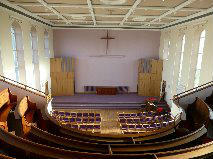 Local architects Ivan Wilson & Associates designed the new interior and Monks of Longridge were the main contractors. 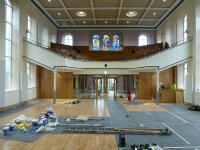 Trinity plans for the new church to be used throughout the week by support groups, young people’s organisations and clubs, older people’s groups and private hirers looking for low cost performance or event space. The church also plans to work in partnership with a range of community organisations to develop activities to meet local needs. For more details contact Jean or Stuart Robinson on 01200 424849 or email jeangranny2@gmail.com. The re-building at Trinity has been a top-to-toe revamp, from the roof repairs which were the starting point of the process, down to opening up the “cellars” to replace the original heating system. 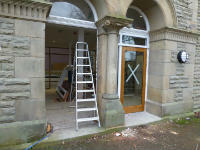 The new doors - here going into place – are designed to let the outside world see what happens at Trinity, as well as to make best use of natural light in inside the building. 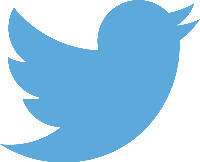 Follow us on Twitter @trinityclithero for regular updates.